Bored with the hot environment in city, Snow Park Goa is the best place for snow lovers like you. Come and enjoy sledging at world’s best Snow Theme Park. Snow Park Goa is a leading snow theme park in Goa provides you a thrilling and realistic experience, as being in the par you can never differentiate whether you are on a hilly region and playing in the snow or in an indoor snow theme park. You can feel the difference from your first step because of the chilling weather inside the park and visual attractions that make your mind believe that you are in a real snow world. At Snow Park Goa you can bring the kid in you out and can enjoy the moments to its fullest. Build snow houses, crawl in igloos and create some amazing, joyous and romantic memories for you and your family. We don’t miss a chance to surprise you and add an extra element to your experience by adding real and regular snow. Our Snow Themed Park acts as an escape from reality and will surely take you into a magical world without much hassle. Goa is undoubtedly the best place to spend your vacations right and we multiply your entertainment experience with our Snow park. The feel of that icy world and snow houses can take your breath away. Snow Park Goa is a place with electrifying and fun activities for both kids, Adults, and the whole of your family. Come pander into playfulness, be a real Eskimo for a while in our snow world to create life long memories with us. Why Choose Snow Park Goa? 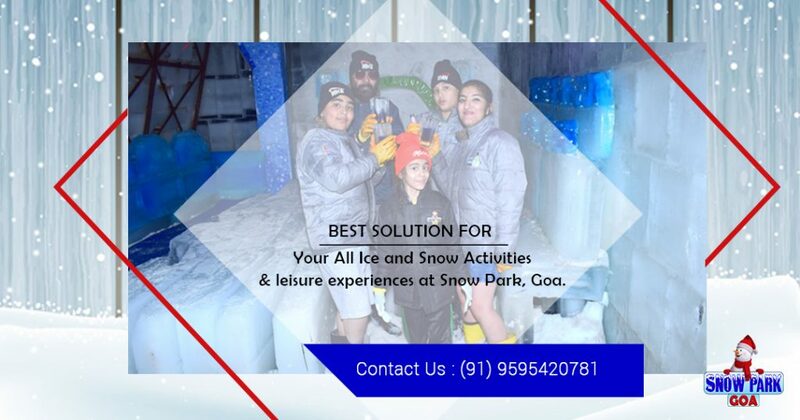 Snow Park Goa is your one-stop and unique solution for your all ice and snow-related cravings and leisure experiences, giving you a lot of cheerful memories. You will know about what we are offering only when you come to your place and build up memories with us. We ensure you to make your visit worth coming and worth remembering.